Don't know what pot﻿ato masher to get for your kitchen needs? Find out how to choose the best potato masher in this article. We rounded up five of the most popular potato mashers that give great value for your money. There are many brands available, but we're here to tell you what to look for and show you reviews of our top five picks! A potato masher is a kitchen utensil used to puree cooked potatoes or any other soft vegetables and fruits. Most mashers are stainless steel for food safety reasons and durability. The mashing plates are either perforated or wired. Watch this video to get an idea of how a potato masher works. Most potato mashers come with handles made of either silicone or rubber. Some even come with soft grips to minimize pressure on arthritic hands. Traditionally, we use a fork to mash potatoes, but now, you can save time by using a potato masher that's even available online. If you want smooth and creamy mashed potatoes, then you'd better get a potato masher. Did you know that with a potato masher, you can create various dishes like egg salad, hummus, and even chopped walnuts? It's because a potato masher can also mash vegetables, fruits, and other soft foods. You don't solely use the cheese grater just for grating cheese, right? The same applies to your potato masher! The best potato masher should have a comfortable handle. Anything shorter than 4 inches is already a challenge for larger-handed users. Metal handles may be durable, but they can be uncomfortable and worse, they can slip from your hands while in use. Some of the most comfortable handles are about 5-6 inches long and made of non-slip rubber or silicone. The shape of the handle should be slightly curved to give a good secure grip. Other mashers even have cushioned handles to provide superior comfort, especially if you have arthritis or carpal tunnel syndrome. To get the most out of your potato masher, look for a model that can mash several types of food. 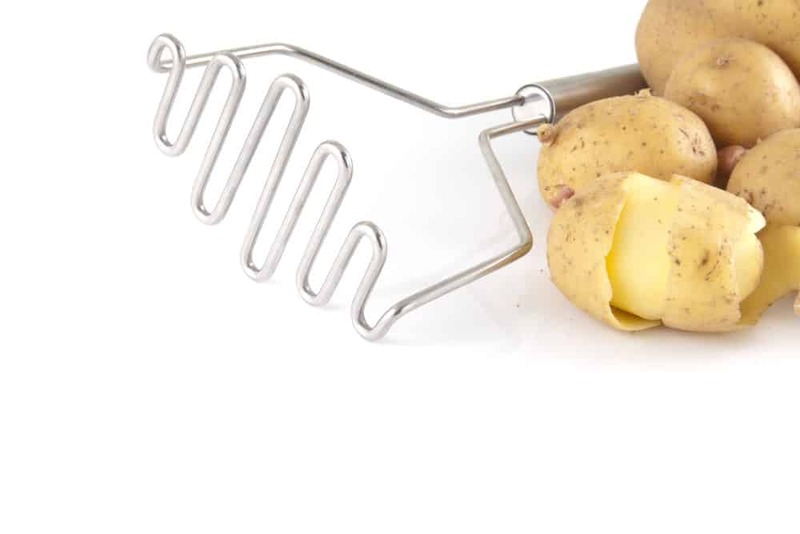 A great potato masher can mash vegetables and fruits. The more types of food it can mash, the better it is.The versatility of the potato masher proves its strength and efficiency. You'd rather get one that can withstand different textures, sizes, and shapes. There are two types of mashing plate: perforated and wave-style. Between the two, the perforated mashing plate creates smoother potatoes and easier to use. The problem with wave-style mashers though is the large gap that sometimes fails to mash some parts of the potato. 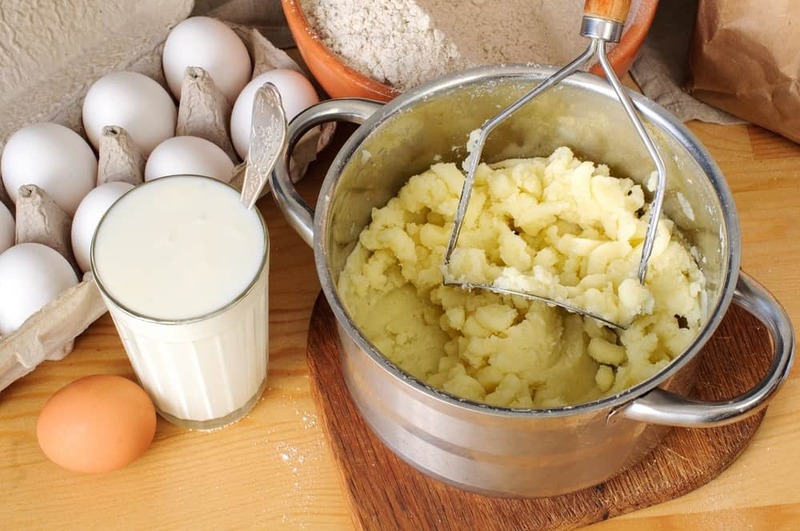 To make a smoother and more even mashed potato, look for a perforated mashing plate with many small holes. The best size of a mashing plate is 10-11 square inches as it's easier to maneuver in all saucepan sizes. If you want a durable potato masher, choose perforated mashers as they remain rigid during hard mashing. Unlike perforated mashers, wave-shaped counterparts tend to bend easily. The most sturdy mashers are high-quality stainless steel that resists rust and corrosion. If you want convenience in cleaning, look for a dishwasher-safe product. However, the dishwasher can't be effective in removing food residue trapped in hard-to-reach areas. Cheaply-constructed potato mashers can come out damaged from the dishwasher. The best potato masher must still look good even after several trips in the dishwasher. Better yet, look for a masher that's cleaned by hand. To make your kitchen look neat and clean, you need to keep your tools and equipment organized. An organized kitchen is important if you have limited kitchen space. The best- designed potato mashers are those with a hanging hole for rail storage. This will not only keep your kitchen organized, but will also save you some counter or table space. The Jamie Oliver Stainless Masher is made of brushed stainless steel for durability. The stainless steel handle is designed with a soft-grip insert to provide a secure and comfortable grip. The masher also features an integrated silicone scraper to remove all you have mashed from a bowl. The perforated mashing round plate is made of large outer holes and smaller inner holes to give a fast mashing ability without any trace of lumps. If you have no space in your kitchen cabinet, you can hang this masher through the hole of its handle. This masher measures 11 inches long. The silicone bowl scraper often gets trapped with food residue. 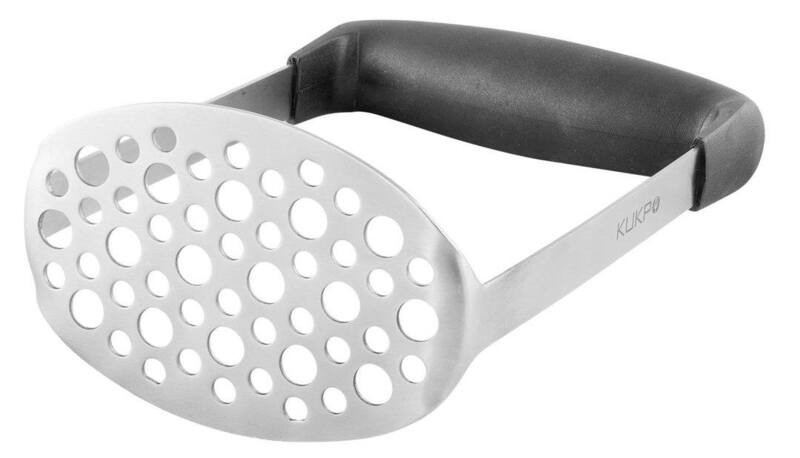 The KUKPO Potato Masher is made of a broadly perforated mashing plate for smoother results. The secure grip allows for convenient potato mashing without exerting too much effort. 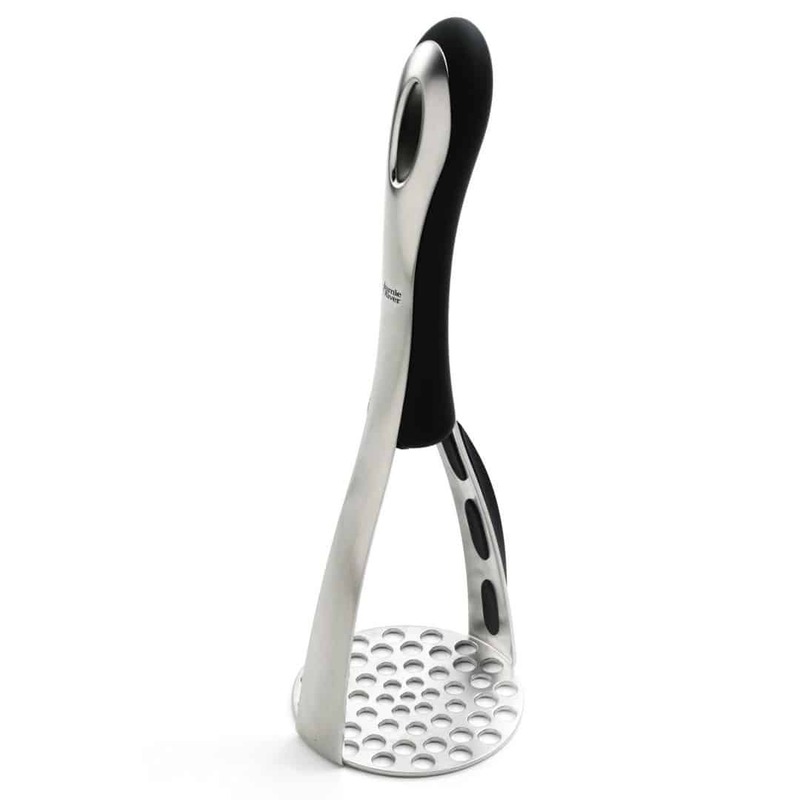 Unlike regular potato mashers, the KUKPO potato masher comes with a horizontal grip to use less effort in mashing. The handle is short enough to prevent the potatoes from slipping when pressed against the surface. The stainless steel mashing plate and rubber handle are also easy to clean under tap water or warm water. Since potato residues are easily removed, the development of fungi is restricted and food-related diseases are avoided. The masher gets bent easily. The edges are sharp so using it may leave some scratches on the pot. 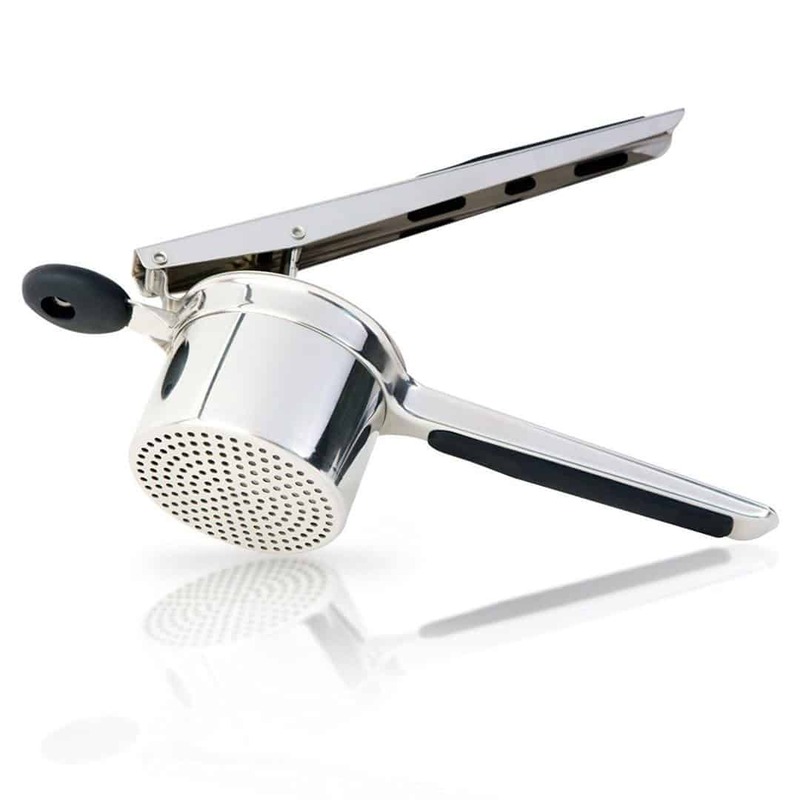 The Priority Chef Potato Ricer And Masher is made of 18/10 stainless steel for durability and perforated mashing plate for smoother results. This masher is ideal if you have arthritis because you won't be exerting too much effort as compared to traditional mashers. With its easy leverage design, you can mash potatoes and other vegetables effortlessly. Watch how the PriorityChef Potato Ricer And Masher works in this video. What makes this masher very versatile is its ability to make fresh fruit juices. The long leverage handles are designed with soft silicone to offer a secure, non-slip grip. Best of all, it's very easy to clean as food residue gets easily removed under running water. The 2-In-1 Mix N'Masher is a 10.25-inch potato masher which also works with other softer-cooked foods, like squash, bananas, and turnips. It has a steel grade of 18/8 stainless steel. With a steel grade of 18/8, expect this potato masher to be tough against rust and remain sturdy over time. To use, just press the wires into the food until you reach the desired consistency. While mixing or mashing, use the side wires to scrape the bowl's sides. Before the food residue hardens, clean the masher immediately. You can also get it cleaned in the dishwasher for thorough cleaning. The stainless steel handle gets slippery when wet. The mashing wire is too flexible to mash properly. 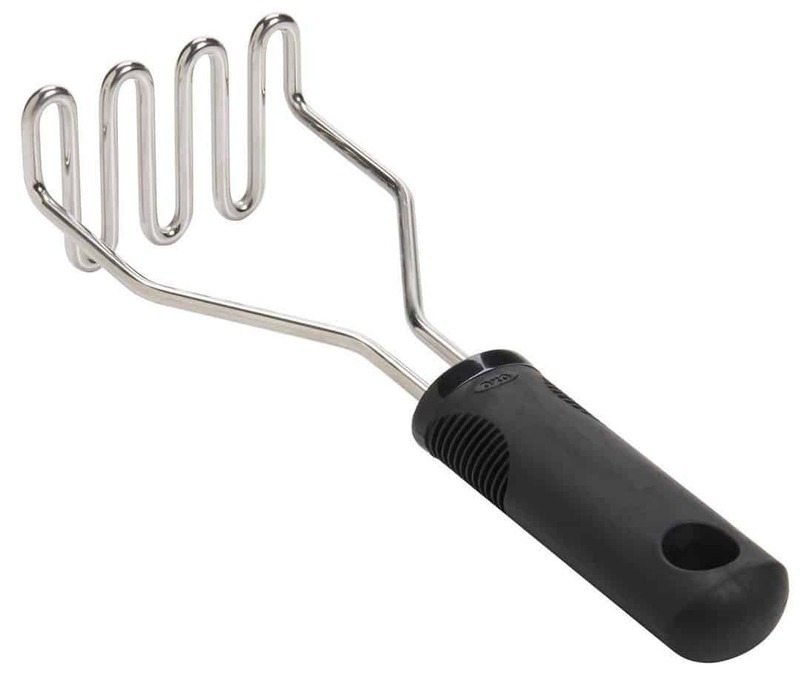 The OXO Potato Masher is perfect for mashing potatoes, root vegetables, and fruits. The wire head used for mashing potatoes is made of durable stainless steel. The rubber handle is well-cushioned to offer superior comfort by absorbing pressure. Even if your hand gets wet, the non-slip OXO Potato Masher is secured and won't slide from your hands. You can use the handle opening on the handle to hang for easy storage. Most people find it taxing to clean potato mashers, but with OXO Potato Masher, you can just let it run in the dishwasher and you'll see food residues removed. Among the five potato mashers reviewed, the Jamie Oliver Stainless Steel Masher is the one we'd wish to have in our kitchen. Why? Because it has the features that we're looking for. This potato masher has a good size, sturdy construction, and efficient perforating mashing plate. Additionally, it's quite easy to clean and is versatile. Have you tried any of these five picks or own one in your home? Let us know how you find them helpful and how you came to choose that one! If you found this article helpful, please don't forget to share it with your friends!